But I’ll let her describe what the first impression was of her first French meal as it was at La Couronne upon docking on the northern shores of France just hours before as written in her memoir My Life in France. . .
Like many, I learned of Julia’s experience at La Couronne from Nora Ephron’s film Julia & Julia – the first scene depicted was inspired by Julia’s memoir shared above. The curiosity and fascination, and clear love for what she was eating is palpable in the pages and Ephron (or should I say, Streep) brings it to the screen in such a way, your appetite is immediately whetted even if you have just ate. It may seem silly or “touristy” to want to visit the destination of someone you hold in high regard’s first meal, but first impressions are called as they are because they leave a mark on the individual’s memory. 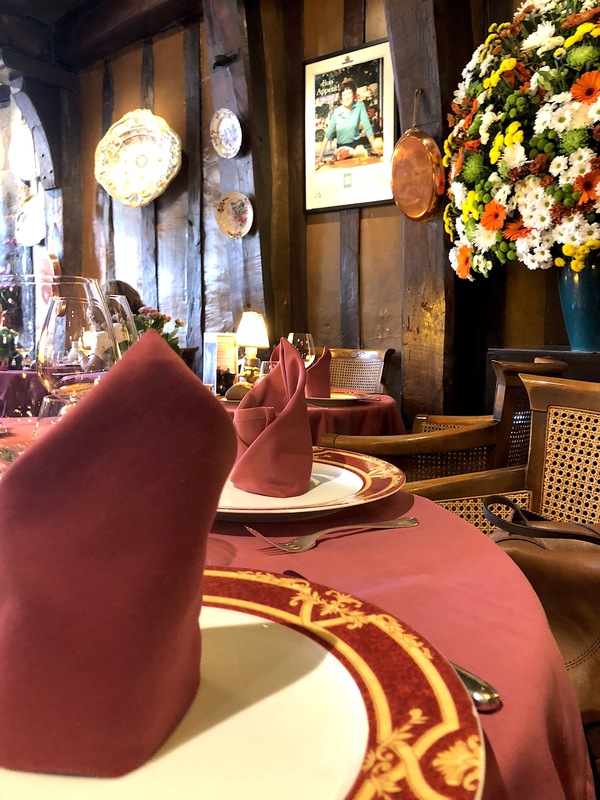 The meal to Julia was extraordinary, to any other French patron dining that day for lunch, it most likely was quotidian, but knowing the French and their love for food, it was most certainly appreciated and slowly savored. The more I read about Julia Child, her memoir, the many biographies as well as her cookbooks, the more her sincere passion for food and curiosity about the culinary world and its flavors is apparent. To be 36-years-old and having just arrived in a country that unbeknownst to her would offer a life-changing opportunity is a lesson to us all to keep following our curiosities. Refuse to throw in the towel and continue to pursue what tickles your proclivities. As I was cooking from The French Chef cookbook a few weeks ago, I was reminded how she was a teacher as much as she was a student of French cuisine and as her career evolved other cuisines as well. She learned and then she passed it on. If you have ever felt overwhelmed by Mastering the Art of French Cooking, I encourage you to pick up The French Chef as the recipes are simple, short, and delicious. As well, you can read and cook them in parallel to watching the series that is available on Amazon as she labels each recipe with the episode it appeared. Enjoying my solo reservation on July 13, a Friday, at 1pm, I dined for more than two hours. While I did chat with the head waiter Gosé (who had worked at the restaurant for 30 years) and assistant waiter Romain (he was a delight and happy to pose for a picture which you will see in the video) who has worked for three, as well as the hostess, Darbin, who was friendly and welcoming sharing Julia’s menu with me and answering my questions, I primarily sat, sipped my glass of champagne and then chablis and absorbed all that I could in that seemingly ordinary moment that was for me extraordinary and in that space 70 years ago was for Julia life-changing. I don’t necessarily know what exactly I absorbed, but I am confident I will know some time in the future. Perhaps we embark on such sojourns to understand that it’s not necessarily the destination that is exceptional, but the chemistry of the individual we admire, the time in their life’s history in which they had to be open to take in what was offered as well as the the seemingly ordinariness. I think what I continue to realize is that so long as we remain brave, so long as we don’t hold on too tight to what we think “must” happen, and along the way engage and enjoy the journey, our lives will turn out often more grand than can be imagined in such a moment. For now I am thankful I had the opportunity to go, to see, to be and to, if nothing else, understand that as indeed as Thoreau shared in Walden we can “meet with a success unexpected in common hours…”. And in this case, it was just a Friday and for Julia it had just been a Wednesday, and for both of us it had merely been lunch, but oh, what a grand lunch it was. Every single bite. Thank you Julia and happy birthday. Enjoy the tour of La Couronne in the video below. Again, you have expressed with such charm a beautiful memory I have from the Ephron movie. The restaurant scene was spiritual for me. I have often been drawn, when eating alone, or with my spouse, to realize that we are meant by God to give thanks for such a meal. I want to thank you for the gift of words you have expressed. I love this post, and the video resonates with your grand experience! Thank you for sharing it with us! May I ask where you stayed when you visited La Couronne? I was on my own last night for dinner. Instead of the usual ‘grab & go’ I took a page out of your playbook & dined alone in a restaurant. No, it wasn’t a 2 hour dinner & I had my book for company but I felt empowered by your travels. My book? Peter Mayles’s 25 Years in Provence….very good company indeed. Cathy, Thank you so much for sharing your experience! And I am so happy to hear you had a wonderful time. It sounds like a lovely and relaxing evening. Isn’t his book wonderful? Little glimpses here and there of Provence. Thank you for your comment again and have a nice rest of the week. That video was so lovely and you captured the essence of what you were experiencing for all of us to enjoy!! Thank you Shannon and Happy Birthday Julia! !